Stuart MacDonald says it has taken an entire club effort to put them on the brink of consecutive promotions. Highland co-captain Stuart MacDonald has lauded the club effort which has taken his side to the brink of promotion to National 1. The Inverness outfit need just two points to secure the second promotion spot behind champions Biggar, with Davie Carson’s men hosting bottom club Howe of Fife tomorrow. Having won 16 of their 20 games so far, number eight MacDonald insists his side have taken last summer’s promotion to National 2 in their stride. MacDonald said: “It has been a fantastic season so far. At the start of the season we had the target of trying to secure promotion, but as the season progressed it became more of a reality. “Last year our development officer Iain Chisholm made clear the standards we would require for this season. To be able to possibly secure back-to-back promotions is a real credit to the commitment the players and coaches have shown. 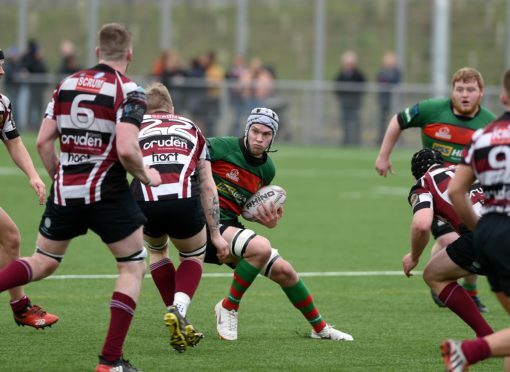 Carson is relishing the prospect of securing promotion at a packed Canal Park this weekend, where Highland have lost only once this season to table-topping Biggar. He said: “It could not get any better. We did the hard work last week getting the points down at Peebles, so hopefully we can get our reward by clinching promotion on our home pitch. “It’s exciting times. This is what we hoped for, but we didn’t expect. We thought we would maybe be mid-table or top-four after coming up. “At Christmas time we saw where we were and had to change tack and go for it. If we do clinch it on Saturday it will be a remarkable achievement to do it in one year. Today’s opponents will be relegated to National 3 following a poor campaign which has seen them win just twice, however Carson says his side must guard against any slip up before they face Aberdeen Grammar in next weekend’s National League Cup final in Stirling. Carson added: “They are bottom of the league with nothing to play for but it will not be easy. “We just need to concentrate on the game at hand. We just need to get the win – never mind about the bonus point.